Artistry: Pen & Ink is a beginner's guide to selected pen and ink techniques. The style is more contemporary than classic. It does not cover all the techniques and art theory that you would see in a more detailed book like Rendering in Pen and Ink. This 128-page book starts off with basic techniques before moving on to step by step tutorials of 3 guest artists. The artists featured are Desarae Lee, M. Ramos, Samuel Silva and Loui Jover. Each artist talks focuses on a specific technique. You'll learn how to create illustrations using hatching, stippling, realism with ballpoint and mixed media. The sections on hatching and mixed media are pretty easy to understand. The sections on stippling and realism with ballpoint are a bit advanced. Stippling requires the understanding of value structure and creating realism requires good observation skills. If you're able to persevere and learn the advanced techniques, then you'll be rewarded with gaining new knowledge. Creating realism is not easy. 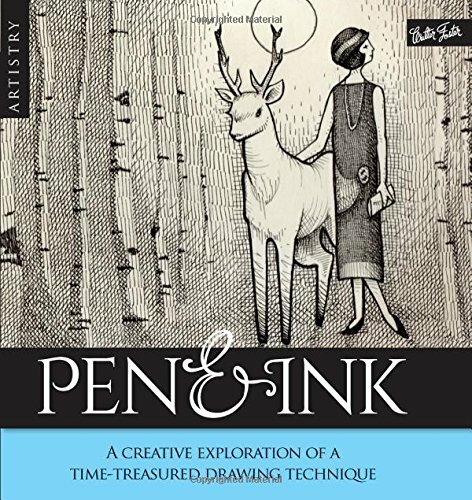 Overall, it's a good book for those who're interested in drawing with pen and ink. It's an insightful book that allows you to explore different ways of making art.